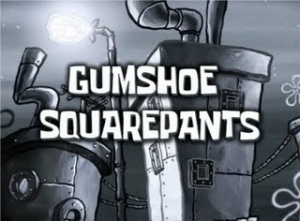 Gumshoe SquarePants (Shorts) – From SpongePedia, the biggest SpongeBob-wiki in the world! The titlecard for the shorts. GumShoe SquarePants is a series of shorts made for The Great Patty Caper. There are 3 shorts in total. 2.3 What If The Mystery Ended This Way? What if the mystery ended this way? SpongeBob tells the story of why he's called "Gumshoe". He steps on gum and chews it. He then steps on Plankton and does not want to be called "Planktonshoe", so he scrapes him into the dirt. SpongeBob forgets his keys and investigates to find it, only to find Patrick had it the whole time. This short shows alternate endings to the scene when the police reveal the "butler" as a criminal accused of stealing ham sandwhiches. In the last part, it shows SpongeBob as the criminal and SpongeBob revealing the policeman as the real criminal. This page was last modified on 12 October 2013, at 19:25.